Healthcare providers are seeing a lot of parents who have chosen not to vaccinate their kids. These parents are doing what they believe is best for their children. The fact of the matter is that there are many misconceptions about vaccinations. Failing to vaccinate could jeopardize their and your child’s life. Vaccines can make the difference between a child living a healthy, long life or suffering with a debilitating—or fatal—disease. Here is more information about vaccines and the truth behind some of the more common myths. Read below for when you should bring your children in for their next round of immunizations. Many diseases spread through viruses, which cannot be cured with antibiotics. Viruses can enter your body a large number of ways. These include breathing infected air, helping a sick person, or even touching a surface that isn’t sanitized. Children are especially susceptible to viral illnesses. For example, they tend to play close together, forget to wash their hands, and touch dirty objects. When germs enter the body, the immune system responds by creating fighter T-cells and antibodies that fight the infection. Sometimes this immune response causes little more than a slight fever and fatigue. Other times the immune system isn’t strong or developed enough to fight off infection quickly—and kids become noticeably sick. Because antibiotics are ineffective against viruses, parents have two choices. 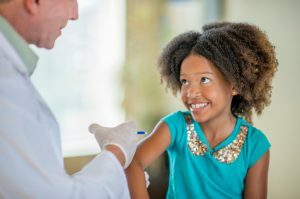 They can choose whether to risk their child becoming sick or preventing the illness altogether by vaccinating their child. Vaccinations in Layton UT are made with weakened or non-living proteins. Vaccine batches are always inspected for safety before dispersal. They are given through an intramuscular shot. This gives the body a chance to respond to the weakened virus or protein particle. Because the virus is dead or weakened, your child will not get the disease. The body will have the chance to develop the T-cells and antibodies required to fight off the infection in the future. Immunity is largely permanent for the chosen strain of virus or bacteria. This is because the body maintains a bank of “memory” lymphocytes that will remember the germ and how to fight it. That’s why it is important to vaccinate your own children. If too many healthy children aren’t protected with vaccinations, herd immunity will cease to exist. As a result, infectious diseases can break out, evolve, and potentially infect new individuals. One of the most common misconceptions about vaccinations is that they cause autism. But, it is important to understand that the 1997 study claiming this was later wholly discredited and retracted. The doctor also lost his medical license. Other misconceptions about vaccines include parents worrying that their child is too small to receive a lot of shots. They may also question the safety of the ingredients within the vaccines themselves. The simple truth is that vaccines are studied vigorously. Also, stringent safety protocols are in place to protect your children. The immune systems of small children are more robust than most people realize. Moreover, the vast majority of children experience only mild symptoms from vaccinations—if any at all. The Bottom line is, vaccines work. Get your child’s vaccinations in Layton, or one of our many locations in Weber and Davis County. Immunization has been proven to protect children from a wide variety of fatal illnesses. These include polio, measles, mumps, and rubella. In fact, vaccines have been shown to create childhood immunity 90% to 100% of the time. They mostly and sometimes completely eradicate illnesses. Viruses that were once the cause of childhood death, debilitating injuries, and a lifetime of health problems are now gone. Many parents have questions about vaccinations, which is why we encourage parents to be appropriately informed. 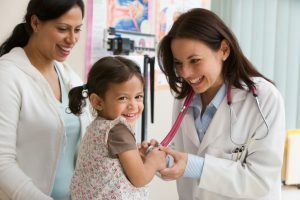 If you have questions or concerns about routine vaccinations, schedule a well-check appointment with Wee Care Pediatrics today. Our providers are dedicated to offering stellar medical care for your child. We can also discuss a wide variety of concerns with parents. Our goal is to help kids catch up on vaccinations in Layton. Whether you are pregnant with your first child or reconsidering your prior stance on vaccination, our team of professionals will do everything in their power to answer your questions and keep your child safe.